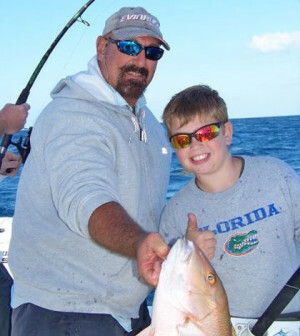 August 1, 2013 by john in Fishing Tips | Comments Off on April Means From Top To Bottom! For the fishing ADD afflicted angler, it is one of the best times of the year to get outside of the reef. Whether you prefer fishing the surface for sailfish, dolphin or tuna or like to drop down to the bottom for amberjack or mutton snapper this is the time of year that things get hopping. There is a link between the chase for the surface dwellers and the bottom dwellers that many anglers overlook. This time of year both sets of quarry’s territories overlap. The best mutton snapper anglers that I know are also the best at live baiting for sailfish. The waters from just outside of the deep reef out to around two hundred feet of water are the mecca for those live baiting for sailfish. This also happens to be the place that many mutton snapper choose to congregate to spawn. By keeping your depth finder zoomed in on the bottom you can more easily see when you happen across any fish hanging over the bottom. The structure that holds muttons in the Lower Keys are often nearly invisible without being able to see the bait holding on the often flat hard bottom. The smattering of soft corals and sponges will barely show up in that depth without the fish that are holding there. Ledges of only a foot or so are also easily overlooked while drifting or slow trolling over the area. The ledges or depth breaks run parallel to the reef line in most instances making it a bit easier to drift the line during the prevailing easterly winds this time of year. Once you have identified likely areas that hold snapper, you can set your surface drifts to coincide with the bottom drift and target both surface and bottom fish at the same time. If you are using live pilchards or live ballyhoo, those baits can both be deployed either top or bottom for great results. Live pinfish on the other hand are better suited for the bottom fish, than the sails or blackfin tuna. Not to say that both have not been caught on pins, it is just that it is a distant third choice for those species. Dolphin on the other hand will eagerly gobble just about anything that crosses their path and will fit in their mouths. Like so many things that happen when fishing pressure is added in an area, the fish get wary and you have to be more and more stealthy. This translates to ever more generous use of fluorocarbon in your presentation. While you can get away with as little as a twelve foot leader of up to sixty pound test, I know commercial anglers who use 24 foot leaders with as little as forty pound test. Using spectra fiber braid is practically a necessity when fishing these depths. First is the fact that braid has virtually no stretch making it super sensitive to the slightest nibble even several hundred feet down. Secondly, the tiny diameter compared to monofilament line allows you to drop straighter down with less bow due to water pressure. Using the least amount of weight that will get your bait to the bottom is also a good idea. As little as four ounces is a great starting point in your weight selection. You should be able to keep it under six ounces. Separate your spectra braid from your leader with a barrel swivel. I also like to put about twelve feet of fluorocarbon between my swivel and braid to act as a chafe guard for the weight. With my charters I prefer to use extra strong circle hooks and fish the rods out of the holder to avoid premature strikes, however many experienced anglers will use j hooks and prefer to hold the rod. On the surface rigs I feel that light circle hooks are necessary. The light hooks help to increase bites while helping to avoid hooking sails anywhere but the corner of the mouth. Circle hooks do tend to be problematic for dolphin; however the few that are lost are worth the sacrifice, to ensure the health of the sailfish population. So when asked this time of year if we should we go bottom fishing or live baiting my answer is an enthusiastic YES.